We are grateful that Boston Area Gleaners' work has been honored by the following organizations and individuals. in the Small Nonprofit Category. 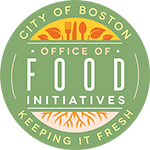 Our Executive Director was named a "Hunger Hero" by the City of Boston's Office of Food Initiatives. October 24th as Massachusetts Food Day.